What's The Best Jaguar V-12 Powered Cycle? After seeing this outrageous baby-blue Jaguar V12-powered trike from Kiwi-land on eBay, we immediately thought of Jagged Edge, a twin-turbocharged motorcycle version. Now we want to know, which madness-machine stokes your fires and why? Sure, it's not a two-wheeled motorcycle, but on the scale of ridiculous things, the trike does pull off the insanity of a 5.3 liter V12 engine swap with a certain style, especially in it's earlier, more raw, red incarnation. Maybe it's the fat tires, those hot rod-style aluminum tank and those lusty chrome pipes. Jagged Edge on the other hand is a just pushes the limits of reason. Sporting the same Jag V12 as the trike, it's been twin turbocharged and dropped into a modified Kawasaki GPZ1100 chassis with a hard tail rear. Certifiably insane would be one way to describe it. 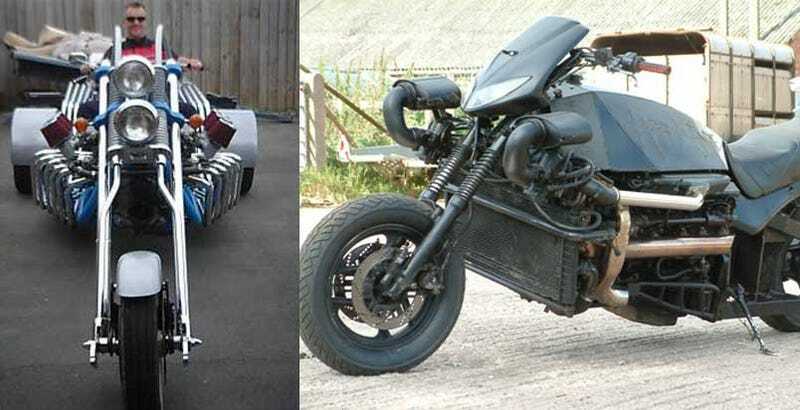 So here we are, which of these two murderous hot rod cycles tickles your fancy? Vote for your favorite and let us know why.